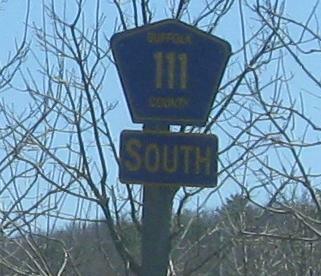 New York Roads - Suffolk CR 111 Captain Daniel Roe Hwy. Saving the best for last, I start in the north. CR 111 NB ends at I-495 and the two lanes merge into one. This is a 1960's design that was obsolete by the 1980's. Parts bin materials at the bottom of the SB offramp (there is no NB offramp). 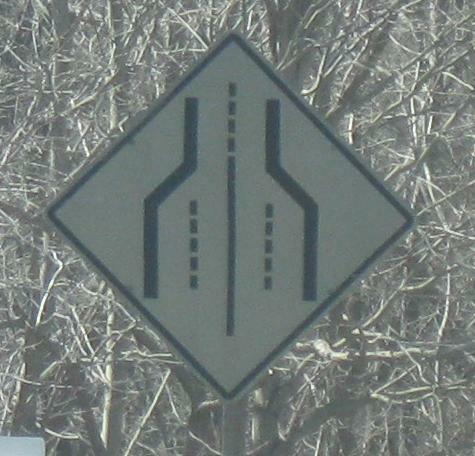 Only the South and accompanying arrow look close to matching. 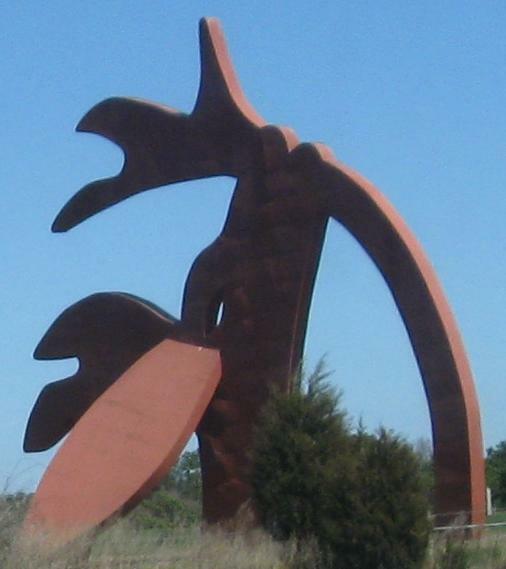 This may look like a gigantic drinking chicken, but it's in fact Linda Scott's Stargazer. 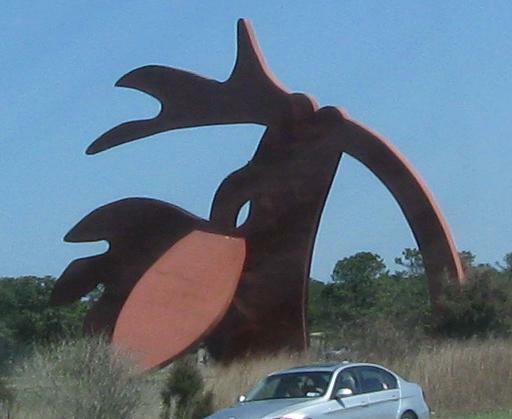 The intent is that a deer looking to the sky represents the gateway to the Hamptons, at least if you're coming from I-495 instead of the southern route via NY 27. Okay, now that I know it's a deer, I can sort of see it, but why is he eating a giant tulip? CR 111 comes to an ignominious end at a signalized stub. I suppose in the summer there's enough traffic to warrant that signal, but it's just stupid in the off-season. 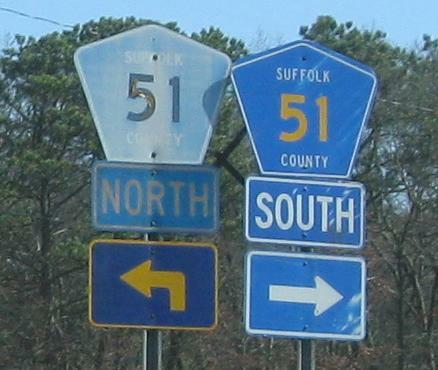 The highway was supposed to continue south to CR 80, Montauk Highway and original NY 27. Most traffic isn't going down there anyway, though, so maybe a two-laner would suffice. 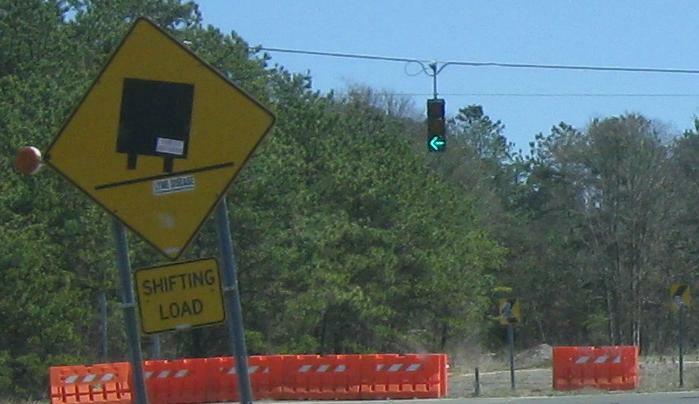 The shifting load sign is decidedly non-standard. The SB and NB sides of the little loop behind the barricades. I don't see what's so harmful that this needs to be shut off - were people flying down the highway, not paying attention, and crashing into the forest? 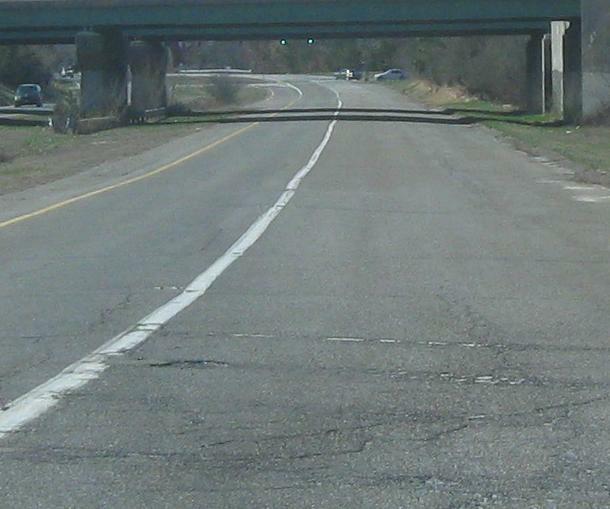 Views of the stub from the NY 27 EB offramp. In the second photo, you can finally see that there's light pavement, not dirt. Heading north again. In the background, NY 27 WB traffic comes in and heads toward I-495 on Sundays.